Winner of an architectural competition organized by the City of Montreal, this sports complex is characterized by its long-span, flat, horizontal wooden roof structure (70 meters without column) with crossed and quasi-random frames. The glass envelope on the three façades of the building creates a climatic barrier while favoring natural lighting in profusion. 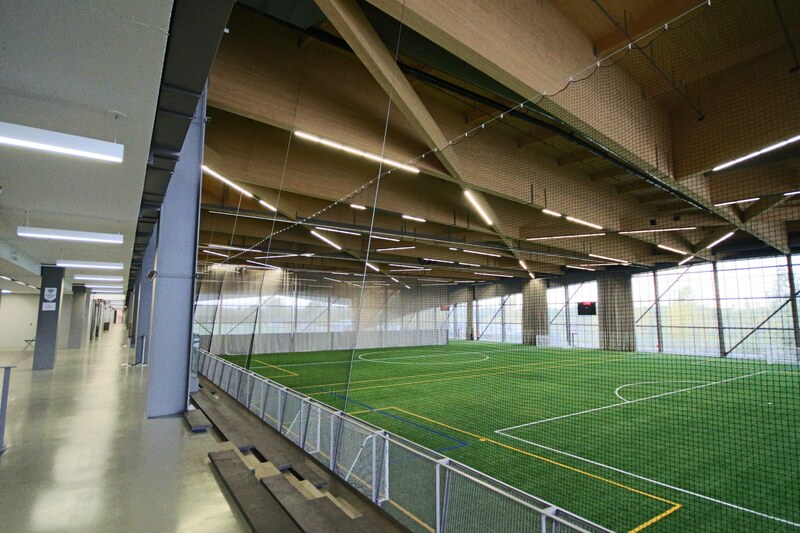 The project has obtained LEED Gold certification, a rarity in Quebec for a sports building. Part of a bigger project divided into three phases carried out almost simultaneously, this sports complex includes an indoor synthetic field and more than 750 seats of internal bleachers. The adjoining building has 3 levels and includes changing rooms, training and physiotherapy rooms, a food court and an event hall. The last level is dedicated to the mechanical room. Outside, there is a synthetic illuminated soccer field with 600 seats. To accommodate players and spectators, more than 170 parking spaces, bicycle racks and access to public transport have been set up. It’s worth mentioning that the complex was used as a training ground for professional teams as part of the Women's Soccer World Cup which took place in Montreal from June 6 to July 5, 2015.